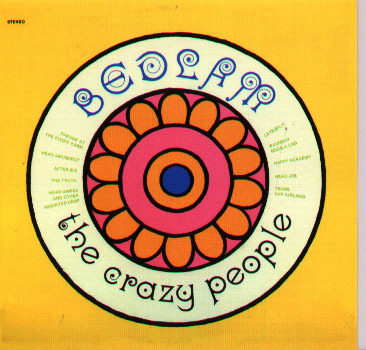 The Crazy People and the album Bedlam is one of those mysterious projects released in the late 60’s that has caused many collectors and music experts to speculate and create stories as to who the band really was and why the album was recorded. What is known about the band is very little but in fact they were most likely made up of Canadians. It is known that the album was recorded in Burnaby, British Columbia in 1968 and it was originally released on the small independent Condor label. The main theory that is upheld by many musicologists is that the album is the project was the brainchild of the eccentric Johnny Kitchen, an expatriated American, who was known to be in BC around the time the album was recorded, and a group of studio musicians from the Burnaby area. On the original album all of the performers were uncredited but some of the song writing credits were given to Kitchen who was a very prolific songwriter at the time writing songs for The Crazy People as well as other bands that recorded on the Condor label. There is a confirmed connection to another American performer, Wild Man Fischer, the always strange acid casualty and L.A. based performer who recorded with Frank Zappa and released one of the weirdest albums of 1968. With many theories and conjectures, the Bedlam album remains a mystery to this day despite its current re-release on the Gear Fab label. Musically Bedlam is a hodge-podge of weirdness and psychedelic soundcollages, comedy and political satire in the same vein as such acts as the early Mothers of Invention, the Firesign Theatre or the Fugs mixed with disjointed melodies and 60’s exploito sounds. The songs may start off in a groove then all of a sudden this weird voice will jump in with mad rambling , sound effects and a political statement. While half of the album is pretty inaccessible , some of the music does shine through the weirdness and one realizes there is a talent behind this project. Bedlam is a strange trip that would be more at home in the streets of Los Angeles or Greenwich Village than in the conservative western city of Burnaby, BC. One of the strangest albums ever to come out of Canada that still remains a mystery to this day. With this re-release someone might be able to shed some light on the history of Bedlam by The Crazy People.